Web site is at www.arch-photo.com. The online catalog isn't as good as the paper one...I think you need a decoder ring for the web site. I'm at a loss for words today - I gave blood and I think they accidentally drained my brainpower. So, today is a photo day. It's a photo that won't fit on my scanner (about 12x15 or so). I tried scanning in two pieces & putting together in PhotoShop, but couldn't get it right. Oh well. Grrr...I deleted this one from the other day...just re-adding. Mr & Mrs. Smith - Love the film. Bought the print. $12 with a plastic sleve. Go buy one. The other site selling Masterprints is www.moviegoods.com. Here I go, spending your hard earned cash again. The artwork on these look pretty decent. Some move posters from the 30's you go "huh - that's who?" I will admit though, the look on Helen Hayes' face below looks a bit odd. 4/16: Just removed the MP3 - If you're still interested in getting the file, leave me a comment. 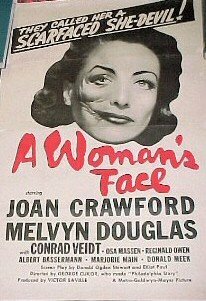 Watched a Joan Crawford flick last night, A Woman's Face, from 1941. Had an interesting description, so I Tivo'd it. At first it was hard to get into this one, maybe because it takes place in one of those Nordic countries (Sweden? I forget). Gets better as it goes on. Joan has a scar on the right side of her face, has plastic surgery, and changes her criminal ways, blah, blah. 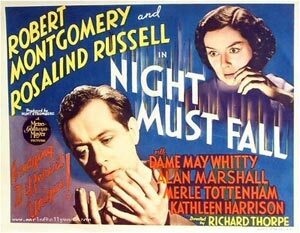 Melvyn Douglas is also in the film. I can't get into anything of his - I keep thinking Mr. Blandings. He always seems to be second to the female. I'm home sick today, so I'm spending more time on the computer than I really should. Finally finished After the Thin Man. How could Jimmy Stewart be the murderer? So not right. Looks like Asta also got a raw deal from Mrs. Asta. And why can't Mrs. stay inside with her other half. Oh wait, dogs can't be married. I'm in the middle of watching Mr. & Mrs. Smith (again). It's the film I pop in when I feel crappy or sad or in-the-middle. Cool movie - Ride the Pink Horse. Have only seen it once, but burned it to DVD off Tivo...so I could have Pink Horse night any time now. Go download a higher res pic here. 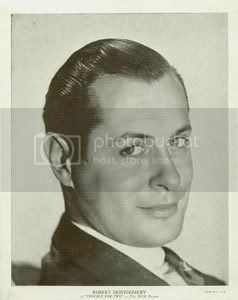 Looks like TCM is planning a small birthday bash for Robert Montgomery...a few days late, but how's the saying go, better late than never. Let's hope no one dies again to preempt this schedule. ONE Film only in April!? Now May...that's another story. More to come. My iPod is stuffed with about 2 GB of old radio shows. There's a great site called RUSC.com where you can subscribe & download MP3 files of old shows. I subscribed for a month & downloaded as much as I could (for cheap, too). My fav show is Suspense & the remakes of Hollywood films with the big stars. 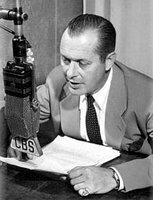 An hour of suspense with the distinguished actor/director Robert Montgomery as the host. 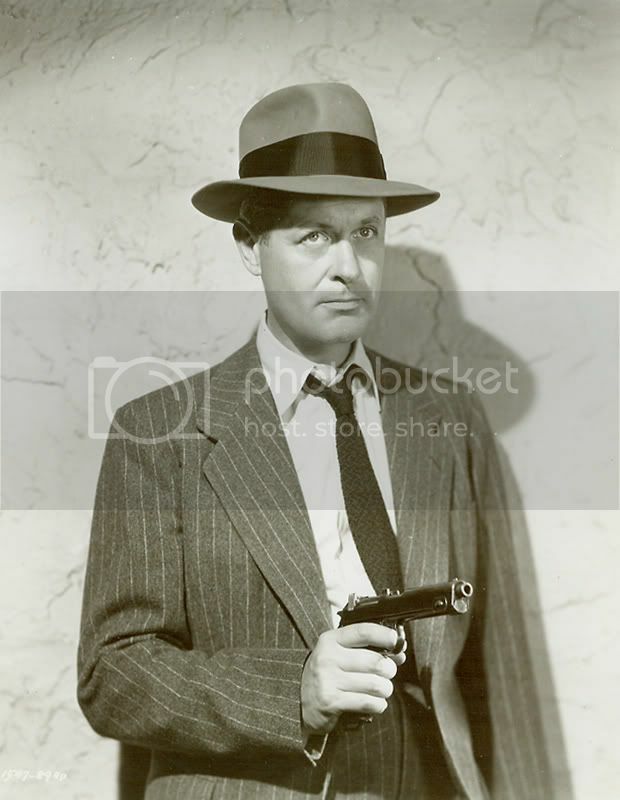 In this episode the star is Howard Duff famous for his roll as Sam Spade Detective and as Spade he will appear in The Khandi Tooth Caper a Suspense play produced, directed and edited by William Spier. London 1820, Beau Brummel's fashionable house. Brummel discusses the events of the previous evening with his manservant. He is reminded that a note has been received from a certain party that the £3000 which he lost three nights ago is due to be paid that very day. A marriage to a rich lady of some standing would seem to be the answer. You look out of your window at the apartments opposite and see a man sat in a chair facing the window. The next day you look out of the window again and the same man is sat in the same chair in exactly the same position. What do you do? Do you go across to the apartment block over the road and check it out for yourself. What if the apartment superintendent checks with the two spinster women living in that apartment only to find that there is no man in that apartment? You return to your own apartment only to find that the man is still sat in the chair - still in exactly the same position! There's a more complete list of RM's radio shows over on the Earl of Hollywood web site. Started watching Hitchcock's Jamaica Inn the other day. Can't get into it. I typically love Hitchcock films, but this one is just not bringing me in. Don't get me wrong, the scene of the ship beaching and all bloody hell breaking looks is pretty compelling. Maybe it was seeing Charles Laughton eating. I'll give it a half-hour. If not, delete from Tivo. No time to write today, just get a photo. 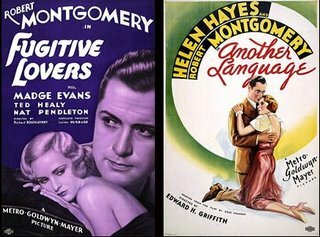 Back to Robert Montgomery & Jeff Bidwell. "I'm sawing you off..." a term I've never heard of, but pretty effective when paired with a hand sawing your arm off movement. Bidwell attempts to "saw off" his ex-wife (and really good friend) Mrs. Bidwell. Doesn't work. He does though successfully "saw off" Mona. That's another thing. Throughout the film, Bidwell is always talking with his ex, they're good friends. It's almost creepy. Anyhow, that's my take on the film. Want a more thorough review? Go to the IMDB. Oh, one last thing. Watch for the Mr. Lepedis, the bail bondsman, trying to talk sans dentures. Too funny. TCM aired Made on Broadway at the beginning of March and I just finished watching it. 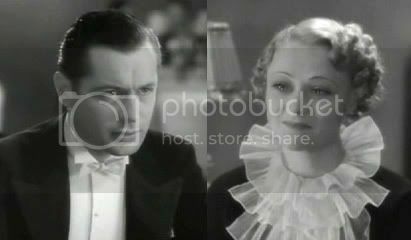 The film features Robert Montgomery, Sally Eilers, and Madge Evans. The credits note the story is based on Courtney Terrett's (or Courtenay) original story "Public Relations." I bet if it were a book, it'd be a hoot. I work with PR people, so I can relate a bit to the tactics to take a story and mold it to your point of view. Anyhow, Montgomery is Jeff Bidwell, a PR guy who helps all the bigwigs and celebrities in town get out of predicaments. He also runs a speakeasy in his home (yeah!). 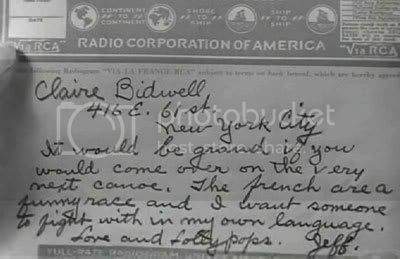 Bidwell is on a ferry when a young lady (Sally Eilers) attempts to commit suicide by jumping into the river. Well, he jumps in, saves her, and "Mona" is born - the product of a PR mind (and some makeup). You see, Mona kills a man later and we see how Jeff Bidwell's "connections" help her. One thing that struck me was the lighting of characters in certain scenes. There seems to be more dramatic lighting - bright on one side of the face, shady on the other. I honestly don't know if it was intentional or just a product of the photography (or just me). This post has an example, which really doesn't turn out on the PC as good. Here's an interesting pic (it was also cheap). I've seen these MGM "mega star" photos in books before. I believe this is one half of a larger MGM star barn photo. Here's a larger version of the photo where you can recognize folks. 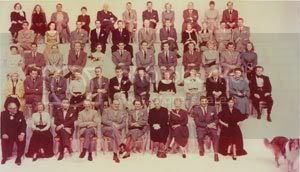 Lets see: Lassie, Lionel Barrymore, Fred Astaire, June Allyson, Van Johnson, I think there's Clark Gable. Yeah, some of the folks look real happy to be there. The Crown Prince is to marry the Princess Brenda of Irania, but the Princess declines the arranged marriage. Just got back from a local movie collectible show, held in a beer & cigarette smelling bowling alley hall. Ahh, atmosphere. Absolutely squat there. The show is turning into a horror collectibles show. And of course, you're getting the people selling tubs of unorganized piles. I think ebay is having a big effect on shows like this. When I first started going, there were piles of B&W 8x10s cheap. Now there's hardly any. Yeah, the prices on ebay are high, but at least it's easy to locate stuff. People watching at these shows is always interesting too. I'll post scans of some of the stuff I got later. Nothing spectacular. It's 1938 and Topper Takes a Trip. Yep, finished that one up the other night. The sequel to the original Topper movie, it's entertaining...meaning it isn't not a real mindbender or bore. 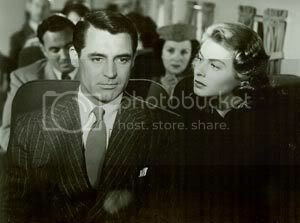 What's odd is how they splice film in from the first Topper movie, to let you know what happened to get Cosmo Topper into his predicament with the Mrs. As it notes in the credits, Cary Grant kindly allowed the footage from the first movie to be used in this film. Guess he was too much $$ to get him into the sequel (or some contract issue, etc.). Not having him in the film is odd - he just seems to disappear (ha, he's a ghost) throughout the whole story. 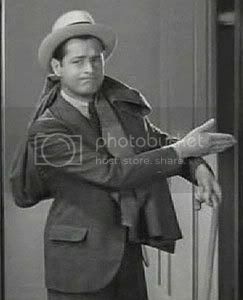 Roland Young is cute in the movie...lots of mumbling & dancing with himself. Nuts, thought I had this flick on DVD with the Topper two-DVD set. I was going to add a screen grab of my favorite scene. Constance Bennett holding Mr. Atlas (Asta the dog) standing next to the tail of a DC-3...while it's flying. Ghosts have the coolest jobs. 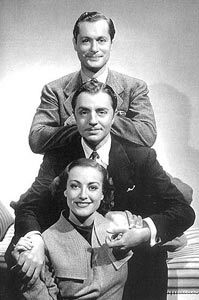 Ya, how could I forget to add a blurb on a film including William Powell, Robert Montgomery, and Joan Crawford: The Last of Mrs. Cheyney. I TiVo'd the film off TCM back in January. I'd recommend the film just on star power alone. That aside, it does have a unique storyline with Crawford robbing Montgomery's family of precious pearls. The movie name was bugging me until the last two minutes of the film....aha! The Last of Mrs. Cheyney has been released on VHS, but no DVD. Logic would make me think that since the studio released one version, the other would follow...some day. Yeah, so I'm about two movies into the Thin Man box set. Word to the wise, watch a Thin Man movie in one sitting. I typically watch a movie while on the treadmill each night, in 20-30 minute increments. I'm getting lost on plot lines. 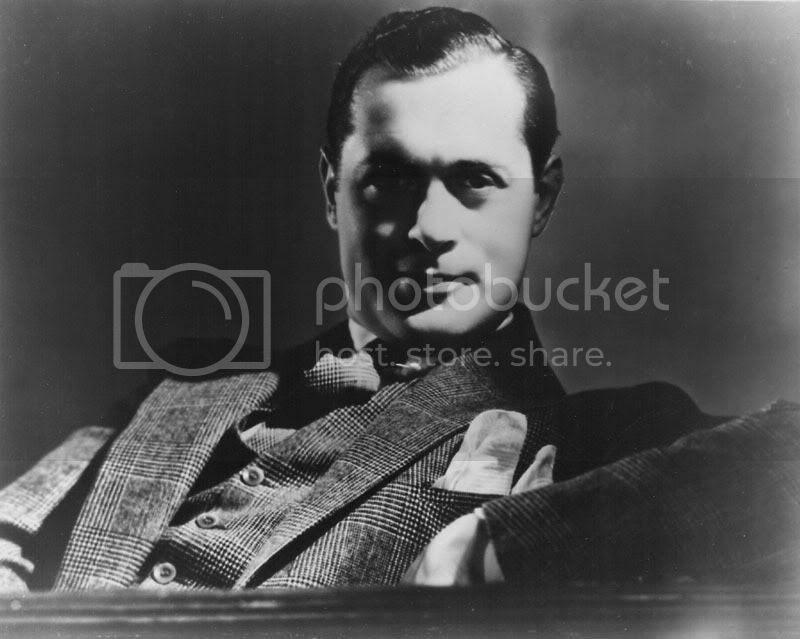 Anyhow, ran into a nice William Powell fan site yesterday - check it out at http://themave.com/Powell/. I had the puttins scared out of me when the site first came up - Powell's voice rang out of my speakers (so beware). I also watched about the first half of My Man Godfrey the other day....deleted it from TiVo. The copy off of TCM was terrible - bright & blurry. You'd think a better copy exists. Another tidbit from The Digital Bits web site: John Wayne box set coming out 6/6 including They Were Expendable and The Wings of Eagles. Know the connection between both movies? Wings is about Frank "Spig" Wead, who wrote the screenplay for Expendable (and was also a Naval Aviator). And what's with submarine movies having characters named "Brick?" 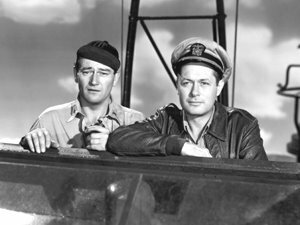 RM film Hell Below also includes a young Robert Young as "Brick." (Isn't that the last nickname you'd want on a Sub?). Back to the subject, They Were Expendable is available on DVD right now - by itself - no box set needed. I have it here, but haven't watched it yet. Bookmark this web site - www.thedigitalbits.com - an excellent source for upcoming DVD information, including info on classics. 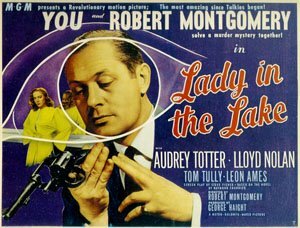 They're reporting that Lady in the Lake is coming soon in the next WB Film Noir box set (Volume 3). No date information yet. Lady in the Lake is an interesting movie. Audrey Totter kinda gets on your nerves after a while, but the whole movie is an interesting concept. I collect movie memorabilia, especially black & white 8x10s of favorite movies and actors. I'll have to say that the slickest photos out there of actresses & actors are those done by photographer George Hurrell - of which I own zero copies of (can't afford them). I'm not going to get into a Hurrell bio, but you can check out the one on Wikipedia. Buy Hurrell RM pics from MPTV Starlight Gallery - I asked them about other RM pics for sale and they have a whole other set of photos not appearing in the Gallery site. Drop em an email. Do note that you'll probably be paying around $275 for an 11x17 print. Starducine.com offers some RM rerints at various sizes. Haven't purchased any so I can't speak on the quality of the prints. Last, a book I don't own but hope to find - Hurrell's Hollywood Portraits, by Mark Viera. Find it on Amazon. Ok, I've decided to start my own blog. I'm sure I'll be writing to an audience of two - myself and whover stumbles across this site. 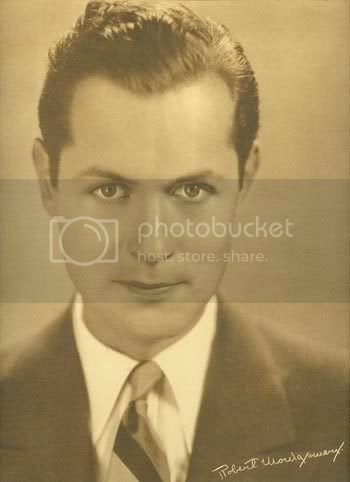 Why Robert Montgomery? Well, I just started watching his films in the past six months & really love his style. 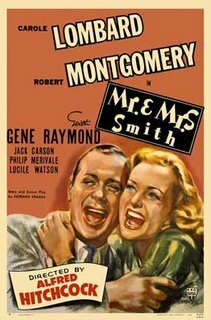 "Mr. & Mrs Smith" was the first film of his I saw. I love Hitchcock films and of course, this flick was in the DVD rotation (how could you not love that film - it's a great screwball comedy). I'll be posting whatever I can find on RM that other fans may find of interest - photos, TV schedules, my movie reviews, etc. I also love B&W film in general, so I'll add my two cents on that as well. I'm currently trying to make my way through The Thin Man box set. I welcome comment from other fans as well, so speak up!